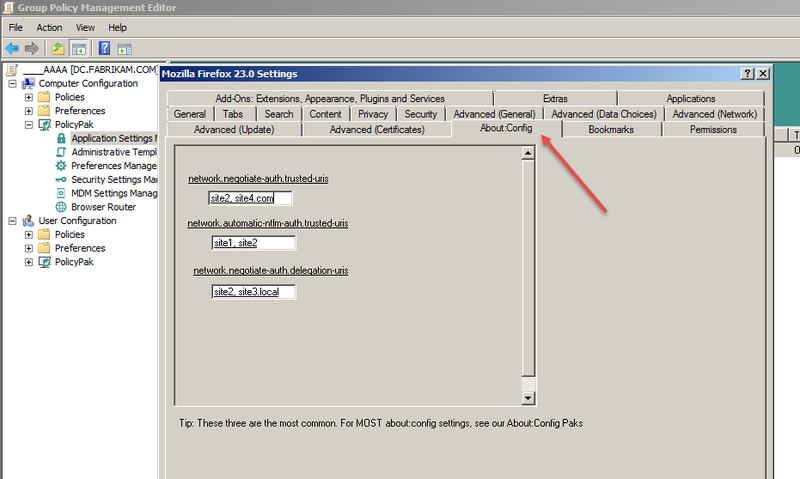 The Firefox core Pak (Mozilla Firefox 23.0 and later) Pak has three very commonly used settings from the extra about:config paks. We add these as a courtesy to this Pak because they are used very often. That being said, they are often used incorrectly. The goal of these settings is to allow NTLM authentication to passthru to specified websites. We cannot direct you on WHICH setting to use WHEN. That’s up to you and your application vendor guidelines. From Mozilla’s documentation here is the explanation of each of these settings. network.negotiate-auth.delegation-uris lists the sites for which the browser may delegate user authorization to the server. network.automatic-ntlm-auth.trusted-uris lists the trusted sites to use NTLM authentication. For use within PolicyPak Application Manager, the use is simple. Each one you wish to use would be a TOP LEVEL domain name list, without HTTP or HTTPS, and separated by commas. So, below you can see some examples of how you could use this. We suggest BEFORE you use PolicyPak to DELIVER these settings to first test your configuration on ONE MACHINE (locally on Firefox) And see if you get the RESULT you want. Then, if you do, then use PolicyPak Application Manager to actually deliver the values you want to all your machines that you wish to get these values.